Just thought I’d share this photo from an appointment I had over the weekend. Linda called to schedule an appointment and in doing so shared that she would be starting chemotherapy soon and wanted to be proactive with preparing for her hair loss. She also shared that her 4 daughters would be joining her for emotional support as well as honest feedback. I am quick to encourage my customers to bring family/friends to their appointments because together we can take an emotionally challenging situation and turn it into a time of support and encouragement. This family did just that. 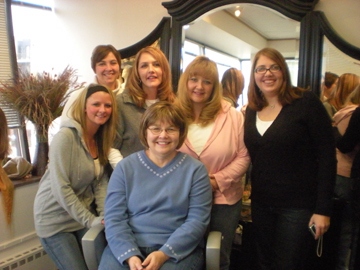 We began the wig selection process and it wasn’t long before the group knew we had found the right wig for Linda. She looked just like Mom! Each of her daughters and 1 granddaugher chose to pitch in and purchase the additional wig care items as well as hats and scarves that she’ll appreciate having in the upcoming weeks and months. Hugs and positive energy sent Linda on her way!